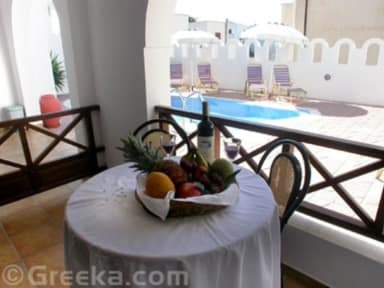 Centrally located within Santorini Island offering tavernas and restaurants full of Greek character, bars, shops, all on our doorstep and within easy walking distance to Fira, Stella Pension welcomes you to an idyllic Greek holiday. Our quiet family run accommodation offers you home from home comfort with 10 spacious clean rooms, en-suite, A/C, TV, fridge, hairdryer and most with private balcony, also a fully equipped kitchen for your use if required. You can either spend your tranquil days relaxing by our privately owned pool or just 2 mins. walk away, take advantage of our frequent local bus services, which will take you to all the hot spots, ensuring you miss nothing our beautiful island has to offer.